The Carlos Quentin comeback experiment will be delayed. The Minnesota Twins made six moves this morning, trimming the roster down to 29 players, including reassigning the veteran Quentin to Rochester. Joining Quentin on the Triple-A roster is catcher John Hicks, who had hit .304/.292/.348 in 12 spring games. Meanwhile position players Darin Mastroianni, Juan Centeno, James Beresford and pitcher Dan Runzler were reassigned to the minor league camp leaving 29 players left in camp. The Twins now have sixteen pitchers, two catchers, six infielders and five outfielders remaining with four cuts left to make. Quentin, who was in the running for a spot on the bench as a right-handed bat, has a June 1 opt-out in his contract. The 33-year-old signed a minor league deal this offseason in hopes of returning after a year off from baseball. He performed well in the spring, hitting a pair of home runs and posting a .250/.333/.500 line over 15 games. Earlier in the week, assistant GM Rob Antony told reporters that the team had a “gentlemen’s agreement” with Quentin, saying that the team would let Quentin out of his deal if they felt there would be no room for the veteran going forward. Quentin’s reassignment paves the way for Oswaldo Arcia to assume the role of part-time outfielder, DH and pinch hitter. Arcia has not had a strong spring, but a pair of opposite field home runs of left-handed pitching this week has given the Twins some reassurances that Arcia’s offseason work is paying off. Interesting. I expected Quentin to stick around until the very end. I'm thinking Quentin and his agent will discuss their options. This might be the Twins' way of giving him an opportunity to explore another job before committing to Rochester. Ryan will address the media at 12:30 EST so we'll learn more soon. So it appears the position player roster is complete. Trim four pitchers. As Chief said, I believe they'll start the season with 12 pitchers. That means this was the very end for position players. Congratulations to Mr. Buxton, then. In many ways this is what was expected, but if Gardy was still around we would have had one of the veteran outfielders on the bench. Good to see some leadership! The pitching has been the big mystery and still remains so. More stories to examine ahead! In many ways this is what was expected, but if Gardy was still around we would have had one of the veteran outfielders on the bench. 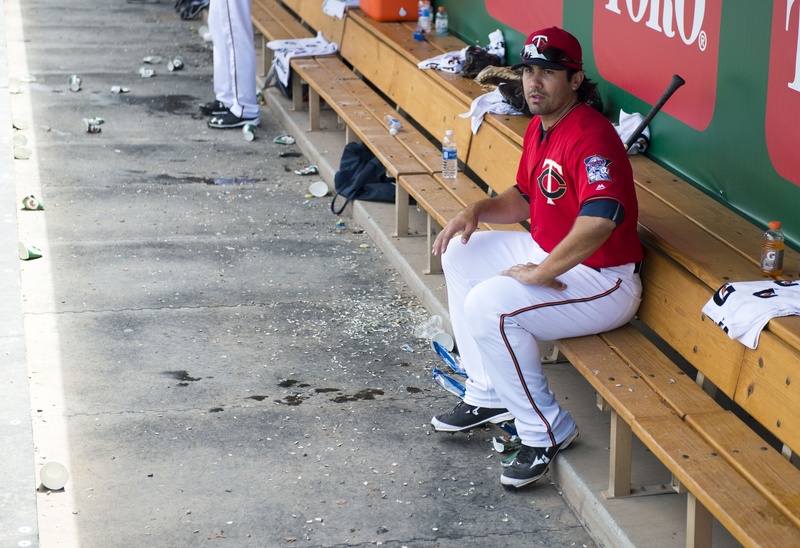 If Gardy was around, his last outfielder would have been either Jason Bartlett or Nick Punto. IMO, Darnell, Kinzler and O'Roarke will be cut. The last pitcher cut will either be Tonkin (whom the Twins will try to sneak through waivers) or Duffey (if Tonkin out-pitches him this coming week. Hopefully they honor their word and let him walk if he wants to. "Room for you going forward" could mean a number of things. Im hoping one of them isn't "stuck in Rochester until your opt-out because we might have an injury." You would hope that they had that conversion before putting the transaction through, anyway. But, you never know with this front office. A few players (some still on the team) have had their share of grievances over the years. I think we may see Quentin with the Twins later this season... all it will take is one injury to an outfielder or Arcia and he'll probably be the guy. It only depends if that happens before June 1st. IMO, Darnell, Kinzler and O'Roarke will be cut.The last pitcher cut will either be Tonkin (whom the Twins will try to sneak through waivers) or Duffey (if Tonkin out-pitches him this coming week. I agree, if the last move is the bullpen I think the team is waiting until the last minute to try to keep Tonkin. I still think he'll get claimed, but he hasn't pitched well, I'm less sure than I was before spring training. By the time Gardy was let go, it was time. That said, Gardy didn't (always) get what he wanted. He was quoted numerous times about his wish to have certain players stay on the roster who were shipped out. I don't know how much influence a manager has in this era, but there is no doubt that the GM makes the final call. The field roster could have been announced in January. Any doubts about Buxtons position were erased when they put Sano in RF. The only mini surprise was that we did not have the annual " reunion tour" with Benson or Mastro being this years guest. But the option issue on Santana and Arcia likely settled that. I am pretty sure the rotation will turn out the same way. One guy is a big buck vet, who has to avoid pitching himself off the rotation, the other guy is a rookie, with options, who has to pitch himself on. Spending too much time analyzing performances can sometimes be fruitless. Some time has to be spent viewing the history of the guy making the decisions, his past is your prologue! Quentin isn't really an outfielder anymore though, so I hope that promotion would go to Max Kepler instead. Keeping Quentin for a time allows them to see if Park is ready. It's hard for me to envision Quentin taking an indefinite assignment at Triple-A. He didn't come back to ride minor-league buses. If he accepts that arrangement, I've gotta think it means the Twins indicated there's a strong chance of a fairly quick call-up. But it's not clear how they could, short of saying "Well, if there's an injury..."
He showed enough this spring that some team would probably have a use for him. We'll see how it plays out. They made the right call here. Gotta stick with Arcia. Of all the things to question the FO about, this isn't one of them. While we don't always agree with their actions, and not everyone is happy about decisions made ... players and TD posters alike ... I don't see the FO acting with such intentional dishonor. Molly: "Carlos, we will be sending you to Rochester. But the moment Arcia does not sprint out of the box, looks lost in the outfield, or flips his bat you will be back up." Carlos: "So I'm in the opening day lineup, skip?" According to Parker, who was in Terry Ryan's pregame press meeting, Ryan said that they are giving Quentin a couple of days to figure out his options and what he wants to do. He's hoping that Quentin will accept going to AAA, but who knows. Yup - no surprises here.The Twins need to give Arcia and D. Santana every chance possible to see if they can stick in the Big Leagues. That 40-man roster is just SOOOOO tight. And it will probably be Tonkin because players without options tend top be given a longer leash than those without (like O'Rourke, for example). And if Arcia can regain offensive value. My guess is Quentin's agent is making calls and trying to find someone who will pay the Twins a little cash for his contract. All it takes is one injury and it doesn't necessarily have to be a Twins injury. Thankful the Quentin experiment is over. Now they can quit wasting at bats on him. He is a total joke anywhere in the field now. Maybe he can get a job starting fights and breaking arms somewhere. Mastroianni must wonder what he has to do to get a job (not that any of the hopefuls really had a shot at making the roster, anyway). Tonkin needs to get a job in Korea or Japan, because he cannot play above AAA ball here. O'Rourke? Too bad not everyone bats left handed for him. The future and the present is the youth. Let's get on with it and stop this tired old vet waiting room gambit. Looking back at some opening day rosters in the last years, it is truly amazing. Why just last year... Jordan Schafer started the year in center field! And for real horror....... check out the 2013 starting rotation! It's the right decision. I hope Quentin accepts the assignment. There will be a spot by May 1st. There always is.